Is high-speed internet access the key to small towns' survival? 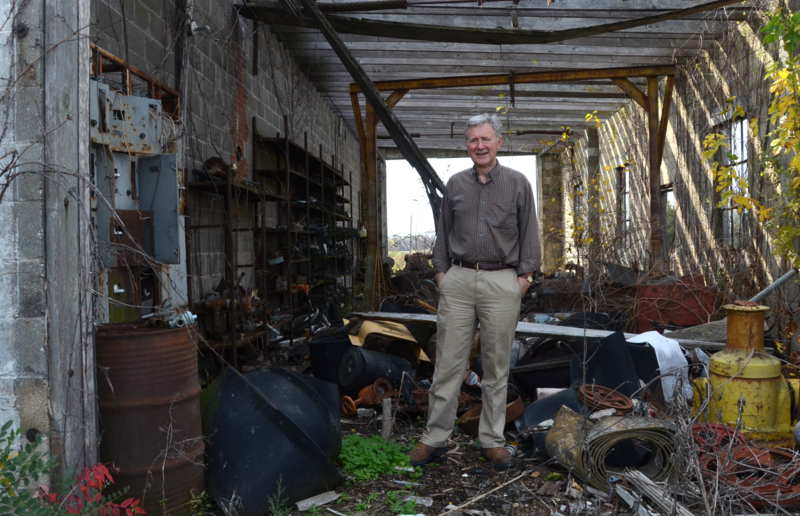 MU Professor Brian Dabson stands in a tattered workshop of the defunct Joe Gilliam Mining Company, which used to mine clay, in Goss, Mo. The town now has zero residents. Listen to a conversation between KBIA's Lukas Udstuen and MU Professor Brian Dabson about why Dabson believes the Internet is crucial to the future of small towns. Is high-speed Internet the way to attract more people to live in rural Missouri? One MU professor seems to think so. First – let’s dial back a little bit. In a story that KBIA aired on Feb. 13, our reporter Lukas Udstuen investigated the story of Goss, a rural town in Monroe County, Missouri. Its population? Zero. Goss was never a big town. At its peak size around the time of World War II, the town had about 30 residents. But as a post-war economy grew, Goss slowly withered away. Udstuen found as rural roads got better, the town’s residents stopped depending on the town’s small businesses and began going to bigger towns for their daily needs. It was a vicious cycle: As people began to leave town for access to basic amenities, the local businesses closed up, driving people away even more. Every census throughout the 20th century shows that rural communities across the U.S. are losing population. Millions left rural America for urban America. Usually, when there’s growth in rural areas, it’s unsteady and unsustainable. In 2010, census data show only 16 percent of America’s population live in rural areas. That’s about 50 million people – the lowest number it’s ever been in U.S. history. For his story, Udstuen interviewed Brian Dabson – an MU professor whose expertise is in economic development and rural entrepreneurship. Dabson believes disappearing rural residents will hurt the rest of America. But asking people to live in areas where facilities such as hospitals, schools and grocery shops are closing is a tall order. Dabson’s solution: provide rural areas with access to high-speed Internet, or broadband – basically, not dial-up connection. “We thought of it once upon a time as just being a luxury, but broadband access seems to be something critical to the future of small towns,” Dabson said. High-speed Internet makes distance learning and telemedicine more viable for rural areas where physical schools and hospitals are scarce. “Broadband is going to be as important for the future of small towns as water supply, roads, telephone and electricity and the rest of it,” Dabson said. Missouri is moving toward providing faster Internet to more of its residents. With funding from the American Recovery and Reinvestment Act, Gov. Jay Nixon launched the MoBroadbandNow initiative in 2009. The goal is to provide broadband access to 97 percent of Missourians by 2014. In its latest numbers report, MoBroadbandNow said 90 percent of rural Missourians now have access to broadband – though the report doesn’t quite define what “access” exactly means, nor does it specify the speed of the broadband connection. At the time of the writing of this blog, MoBroadbandNow has yet to respond to KBIA’s inquiry about how it defines access. Listen to the story about a town with zero residents. Goss stands as one of the smallest towns in Missouri. While driving by, you might miss it if it weren’t for a few green road signs marking the town’s location along Route 24 in Monroe County. If you stopped in Goss to ask for directions – you’re most likely out of luck because, well, nobody lives here. At least that’s what the 2010 U.S. Census reported. The census shows the nation’s population is in flux. While some towns grow rapidly, others – like Goss – continue to dwindle. In September, the state awarded grants to eleven rural Missouri hospitals to improve broadband internet connections speeds. The connection would be used for telehealth, a way rural towns access physicians in bigger cities electronically. KBIA’s Lee Jian Chung brings us the first of a two part series on the expansion of telehealth services in Missouri. A shortage of rural health care professionals throughout the state has health systems connecting with patients in remote areas through telehealth. At the University Hospital in Columbia, telehealth coordinator Samuel Woodard thumbs a remote which sends a camera at the far end of the room spinning around to face him. His co-workers at the Missouri Telehealth Network offices across town appear on the screen. “Hey Katie, how’s it going? We’re just going over the equipment, showing him how the telehealth unit works.” Woodard says.